Amish sugar cookies, cooking, Grandma Miller Favorite Sugar Cookies, Mary Lou McMillin, Mary Lou McMillin Sugar Cookies, Mennonite cooking, Presbyterian, sugar cookies, Whatever Happened to Dinner? 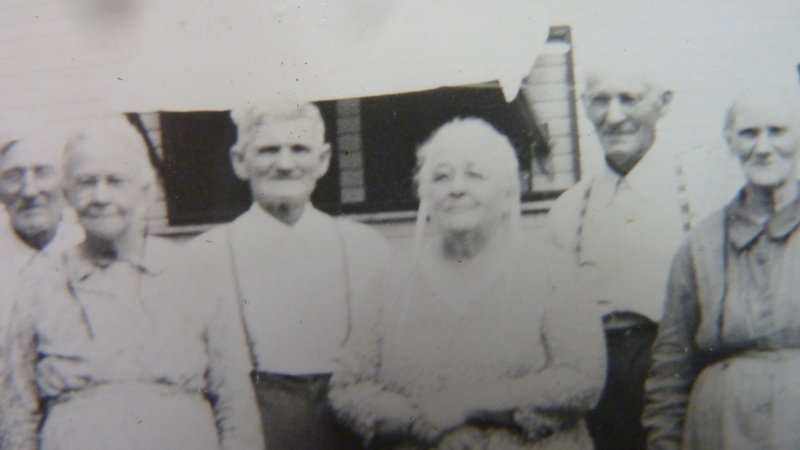 My paternal grandmother, Barbara Kauffman Miller, center, in the 50s when they lived with my family. 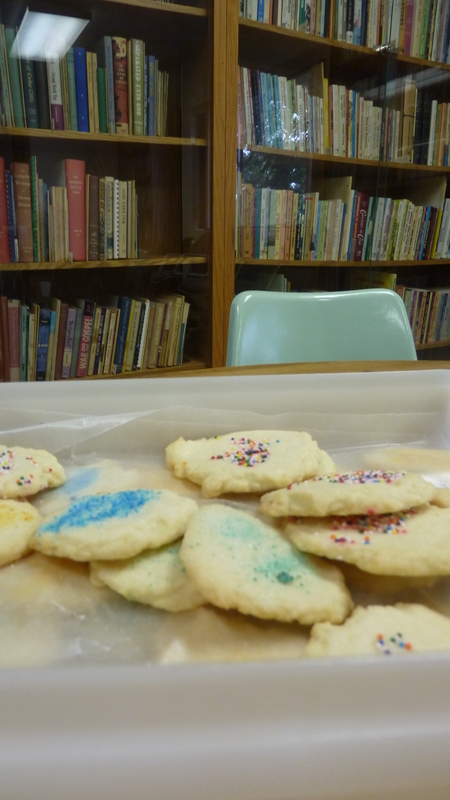 Since I just wrote about Grandpa Uriah Miller, I thought I would feature Grandma Miller’s famous sugar cookies for my recipe of the week. Plus my cousin just asked my mother for the recipe. But I never make these any more, and have a simpler, not-roll-out cookie that has become my favorite sugar cookie. I hope the Miller family will forgive me. Sometimes you savor the recipes of your youth, but most of us grow up to learn to treasure many new additional recipes. The first recipe is died-in-the-wool Mennonite or Amish in origin. The second comes from a well known Presbyterian Christian educator in our valley, Mary Lou McMillin, and the Shenandoah Presbytery named it’s Resource Center named after her. So together these recipes find harmony in my blog. Grandma and Grandpa Miller started my love affair with cookies and coffee. Since their two room apartment (kitchen, bedroom/living area and small bathroom) were right off of our kitchen all through my childhood, I enjoyed going over to Grandma’s in the morning while she and Grandpa had their breakfast of cornflakes, coffee and cookies. Grandma would pour me half a cup of coffee in a big cup with a big saucer underneath, add half a cup of milk to the coffee (so yeah, it was really more like café con leche like I learned to love in Spain) and we would dunk our cookies in that coffee/milk. At times the cup overflowed with the coffee and milk, especially for childish rambunctious dunkers, but that was okay because it only slopped onto the saucer beneath. This is NOT, however, where the term Dunkard Brethren came from, which always confused me in my youth. So, I have my Grandma and Grandpa to blame for my love of coffee and sugar cookies. Grandma suffered from diabetes (eventually a stroke) so I’m well aware of the hazards of too much sugar. When I first started serious cooking after I got married, I tried Grandma’s roll out cookies once or twice and they simply seemed like they were pasty with too much flour. Did that ever happen to you with a recipe or food from childhood that you didn’t really like as an adult? Dissolve soda in milk. Cream sugar and lard. Add eggs and flavoring. Sift baking powder and salt with flour and add to sugar mixture alternately with milk at soda. 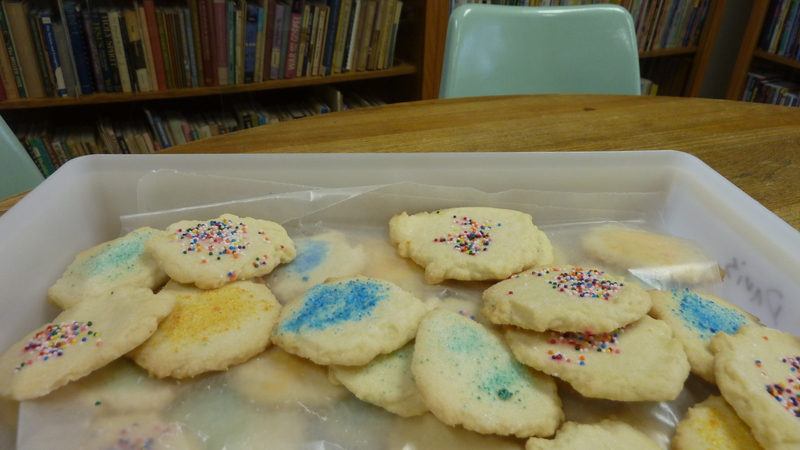 But my favorite sugar cookie recipe for many years is “Mary Lou McMillin’s Sugar Cookies.” They are rich, a half-soft/half-crunchy sugar cookie. They use butter and don’t have to be rolled out (just spoon them onto a cookie sheet and flatten with the bottom of a cup) and can be prettily decorated with red and green sugars or other sweets for very quick Christmas cookies. I usually bake up a batch right about now just to have something Christmasy on hand when the parties and get togethers start where you want to take a plate of cookies or your kid forgets to tell you that you need to bring Christmas cookies to the PTA meeting or to youth group at church. Kids love to add the sugars or squash the dough down with a flour-bottomed cup. They are great to keep on hand anytime of year (using different colors for different seasons). The ones above I made a while back for break at work, to share my good news of an expected 2nd grandbaby in late November. Which is now! Soon! 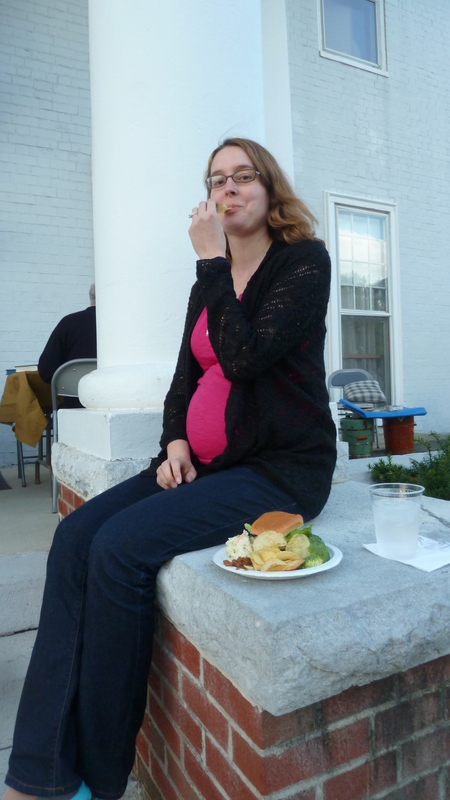 Daughter Michelle in late October, enjoying “eating for two” at our church’s 50th anniversary homecoming. Michelle is still a member of Trinity Presbyterian while an active worship leader at her local church Northern Virginia Mennonite (now that’s Mennonite/Presbyterian harmony). Cream sugar and shortenings; add eggs and vanilla; add dry ingredients. Drop by teaspoon onto greased cookie sheet. Flatten with a cup that you’ve greased and dipped in sugar. Sprinkle with white sugar, colored sugars, or purchased decorative sprinkles. Bake at 350 – 375 degrees for about 10 minutes. Do not overcook. Approx. 9 dozen. 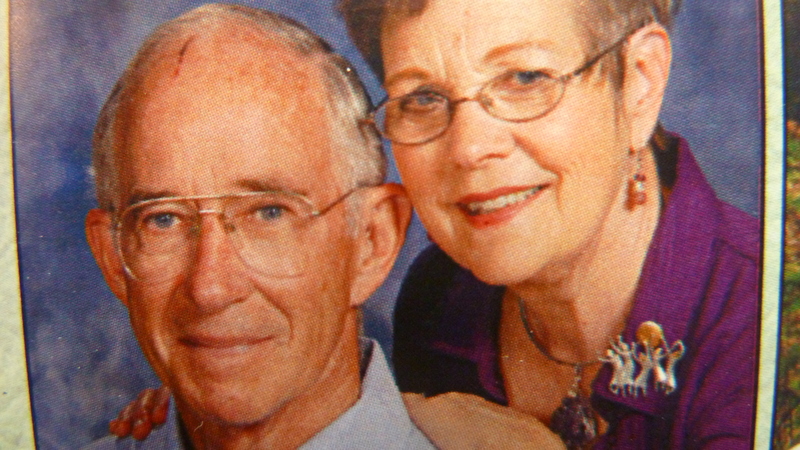 Mary Lou McMillin and her husband, Challace, the first football coach at James Madison University. What is your favorite Christmas cookie? I’d love to see links to your favorites. Are there recipes and foods you loved as a child but don’t care much for now? My book with 100 recipes, Whatever Happened to Dinner, includes these favorite cookie recipes: Snowball Cookies, Whole Grain Chocolate Chip Cookies, No Bake Bars, Blondies, Magic Cookie Bars, Gingerbread Cookies. Purchase at the MennoMedia store. Am I seeing straight? 1 c. oil AND 1 c. butter? Tried your cranberry salad in Whatever Happened. No nuts or celery, a whole big orange, 2 small apples. Wowzer. I kept it in the fridge with the lid off and a spoon stuck in so I could keep helping myself. And I tried Carmen’s spinach mashed potatoes–with chard. Mm. I think I’ll do both for Thanksgiving. Yes, you are seeing straight. I think that was my reaction the first time, they are rich and I guess that’s what makes them good. In limited quantities! But good idea to check. I’m glad you liked the cranberry salad, thanks for the report. Yours was probably fruitier that way, but the celery and nuts make a nice crunch. Any reason you avoided them? But so glad it turned out well for you. I have not yet made the spinach mashed potatoes but ate them at a potluck and while they sound weird I do remember they were good. You Kurtz women just like to mix things up a bunch –good sub of chard. I’m guessing you are using what you have on hand?? Welp, I kind of reneged on the potatoes–made baked potato boats, but topped some with chopped chard. (And yes, chard is what I have). One of these days, now, I’ll take a go at the sinful cookies. Sinful cookies? The Presbyterian ones? Chopped chard would make a nice garnish. I was going to bring a dish of mashed potatoes, and a separate dish of the spinach ones to the family dinner, then our oldest had her baby at 10:15 p.m. Tuesday night so welp here too, all Thanksgiving plans were readjusted mightily. Such a happy chaos! Presbyterian, yes, of course. Never heard of anything sinful that’s Mennonite. I made them tonight, yum. I’m afraid I overdosed. Welcome to the lovely new baby. This is funny because my sister had a Presbyterian roommate at Goshen College and they loved calling each other “Am” (for Amish) and “Pressie.” Glad you liked the cookies. Weekend Blogroll noted that there aren’t very many recipes around on the web for “Presbyterian” anything — Amish, of course, Mennonite, yes; Presbyterian. not so much. It must be the sin factor.